The high and extremely significant growth of demand on information delivery in the enterprises caused that the companies offering business intelligence solutions live their best years. Although the market is still fresh and quickly expanding, a few enterprises managed to outdistance the rest - SAP after acquiring Business Objects and and IBM with Cognos. Both widely-known, both highly-experienced and, finally, both fighting for the leadership. The following article analyzes strengths and weaknesses of both BI platforms, with the main emphasis on weak points of both as this kind of information is hard to find in the whitepapers or marketing slides. We don't compare costs of licenses here as this changes with time and really depends on the organization and at the end the total cost of implementing BusinessObjects and Cognos is really comparable. SAP (Systemanalyse und Programmentwicklung / Systems Applications and Products in Data Processing) company has been founded in 1972, in Germany. The enterprise expanded step-by-step achieving new sectors of computer software industry. The chain of significant successes brought a leadership to SAP that (2009) is the biggest European software enterprise what makes it fourth in the World. SAP became one of the leaders of the business intelligence market after acquiring Business Objects in 2007. Although the list of both – SAP and IBM – companies' achievements seems astonishing, the fight between them still continues. Only the object of rivalry got changed – currently, the business intelligence platforms sector seems to be the hottest. The IBM (International Business Machines Corporation) history dates back to the last twenty years of nineteenth century. Founded in 1889, in New York, Big Blue (as people used to call the company) is thought to be one of the first computer software enterprises ever. Employing about 400,000 workers all over the world, IBM became the largest IT company worldwide. Just to remember – the IBM employees won a lot of awards, starting with five Nobel Prizes. Both offered platforms are popular and widely-used, therefore it's hard to unambiguously choose the better one. All the solutions that have been applied have their advantages and disadvantages, strong and weak points. Even the objective summarization seems practically impossible, separate parts and aspects might be easily compared. There is no better way than to compare the both companies suite separate components. Let's begin with IBM – the business intelligence platform offered by the Big Blue is Cognos. There are two series – 7 and 8 – currently available, but the Cognos 7 – although its Version 4 was introduced in 2006 - gets out-of-date (IBM claims to support Cognos Series 7 users till 2012). The first Cognos 8 software was presented in November 2005 including a few refreshed tools: Report Studio, Query Studio, Analysis Studio (in the place of former PowerPlay), Metrics Studio (instead of Metrics Manager), and Events Studio (replacing NoticeCast). The software was continuously actualized, therefore IBM quickly introduced Cognos 8 Business Intelligence. IBM advertises Cognos as a result of eighteen-years experience earned by fulfilling the demands of more than 23,000 clients, focusing on performance management and business intelligence. In the following article we analyze Cognos BI only, not Infosphere, Infosphere Warehouse (DB2) and other IBM products from the BI family. Cognos is a complete performance management system built from the ground on a single, purpose-prepared SOA (Service-Oriented Architecture) platform. The customers praise IBM business intelligence software for great access to all the data – completely, quickly, and accurately. The common metadata used for the complexity from users optimizes the work. Cognos simplifies consuming the once authored data. The solution offered by IBM enables easy transforming and publishing resources in different languages and formats (starting with HTML, PDF, XLS and other), and accessing them from several locations (portal, e-mail, mobile, search, office). The interface seems user-friendly and intuitive. All the elements may be completely self-serviced – the involvement of developers is not a necessity. If required, the IT developers have an easy way to deploy and manage system. IBM claims that Cognos' features are maturity, stability, and high-participation planning solution – IBM offers a wide range of planning capabilities (advanced scenario modeling, plans, forecasts, budgets). Cognos system function all over the world basing on only one solution – the diversification of operating countries doesn't matter as the platform works for the whole enterprise on a global scale. The analytic applications are fully compatible – stored content might be quickly transformed. IBM provides Performance Management Framework, Innovation Center, BICC services, online communities, free trainings for business partners, a bunch of certifications which makes it interesting as a personal career focus. Cognos – as every new upgrade gets released – changes but some weak points still stay unimproved. First of all, IBM does not support its own ETL and data quality software. Surely, they're available as separate platforms (Infosphere products) or provided by separate vendors. Some aspects of functionality hasn't been implemented while preparing Cognos 8 – for offline reporting and analysis the customer is obligated to move back to Cognos 7 platform. Cognos is known for its performance, scalability, and caching that might have been worked-out much better. Up to Cognos 8 Release 2 IBM haven't offered a possibility of caching across users and reports. Cognos software is divided into more parts than it's necessary. For example, three – Report Studio, Query Studio, and Analysis Studio. Many experts say that three studios might be operated by one common tool (comparable functionality is offered by BO Web Intelligence application). 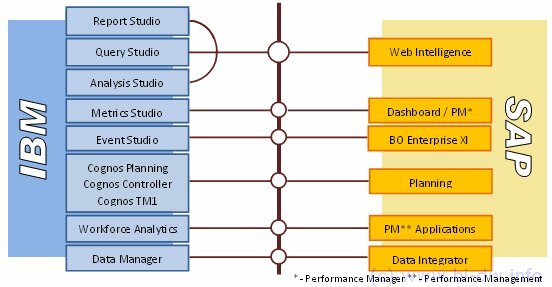 Query Studio and Report Studio seem not as well-rounded as possible due to the lack of power and inordinate complexity. Despite all the advantages, the reporting platform – based on the ReportNet - still stays unproven in terms of huge implementations. Its scalability leaves much to be desired – the loss of performance is significant while adding hardware and users in the same proportion. Next, the problem of visual analytics. Very often the pre-sales demos shown by IBM vendors contain the components from Series 7 or other Vendors not included in Cognos 8 suite. Surprisingly, the authors of the presentation forgot to remind that minor detail (we are talking about PowerPlay and XCelsius here). Further, the cooperation among users of different parts of the platform is hardened – it's possible only using the scorecards of Metrics Studio. The documentation storing is difficult due to the lack of appropriate tool. The same problem applies to enterprise reporting – Report Studio, tool responsible for noticing summarizations, has about half the power of its prototype. The other thing goes around the planning applications that are purpose-built. Remembering about their functionality, the usage is embarrassing as every tool requires learning it from the beginning. The inseparable connections between Cognos 8 and Cognos Series 7 platforms cause strange and unpredictible consequences in their work. Summarizing all highs and lows, there's one conclusion that cannot be omitted. Although IBM Cognos 8 is a great business intelligence platform, it seems to be not as independent as it should. It looks like IBM released Cognos 8 BI a bit too early. So early that definitely too much of the Series 7 was left. The common work of both – 7 and 8 – platforms would be an unequalled combine, but the real goal is to pack the advantages of both suites into the only one perfect-working system. It's the right time to make a slight move to SAP BusinessObjects Business Intelligence platform. We don't analyze SAP Netweaver or SAP Business Information Warehouse (SAP BW) in this article. What SAP BusinessObjects software has to offer? The producer claims platform to be the one to fulfill all the expectation of customers – easy and quick access to all data placed in every part of system with simultaneous growth of productivity and performance. The found data is accurate and relevant regardless to questions' complexity – consolidation and aggregation of data are done to improve the efficiency. Furthermore, the structure of information is flexible, offering good scalability – more receivers and more forwarded data do not slow down the transfer, therefore the decision making might be accelerated. Next, all the information is unified what simplifies the access to all resources independently on their format or location diversification. But still it's not everything. 'SAP BO' platform is praised for the interface – all the dashboards are designed to increase the familiarity and service-intuitivism. Next, the software was created as a single intelligence platform to maximally reduce the effort necessary for cooperation of different users. Finally, the clear and transparent structure of the platform enables an insight into the whole operations – every process within every stage on every level might be easily checked out (and modified if it's required). The timely delivered information helps making right decision due to the shortened time of reaction needed that leads to a significant increase of performance. Last but not the least, easy deployment increases security and functionality of SAP BO platform that is currently accessible for everyone. On the other side, 'SAP BusinessObjects XI' has a few significant disadvantages that should be mentioned (what's probably going to provide practical knowledge much more usable than the list of superlatives accessible e.g. on the producer's website, as well). The first thing that may discourage potential customers of SAP is an unclear BI and PM roadmap – it's built of number of separate products basing on different technology, therefore the integration is not as good as possible. SAP BusinessObjects is repeating risk of gaining inconsistent data results – the data connections should be improved due to their excess and inconsistence. multiple locations options work well but their enabling was inconsistent. Separate parts of the suite differs in the development requirements. The service of software seems embarrassing. Only a few of changes might be done personally by the customer. Most of them demand engaging the IT developers. SAP offers plenty of products responsible for financial consolidation. It's great until it comes out that the communication among them is hardened – lack of migration path. Further, the breadth is stunning but modifying the content requires complicated and labor-consuming IT lifting. The company not always realizes their promises – there is a risk of lateness or even reject of foretold integration. The focus on performance management has been weak. SAP promises to head this direction in the near future. SAP claims that Business Objects is fully integrated with SAP BW and that this kind of integration doesn't require any additional IT work. Whoever tried to create a Business Objects universe based on a SAP BW Infocube knows that this is not the case. As it's clearly visible, SAP BusinessObjects software, providing effective solutions, is on a best way to the success, but the half-baked details worsen the general feeling. Both platforms – IBM Cognos Series 8 and SAP BusinessObjects – have specific advantages and disadvantages. Some of them are major, some only minor. But all of them influence on the usage. The answer which one is better to choose will remain undiscovered probably as long as both companies existence. New versions, additional applications, plenty of upgrades, tons of instructions and white papers – all those are the details. But those are the details that really matter. As long as there's no extremely significant difference between offered platforms, just the details may decide about the fight's result. In the end, when all the possible comparisons are done, all features examined thousand times and it seems that there's really nothing to add, customers should still remember about other options - SAS, Oracle and Microsoft business intelligence solutions and the strongest rivals of both companies presented above. Nevertheless, when choosing the right business intelligence platform for your organization it might be a good idea to precisely define your needs, then talk to the technical sales people from both SAP and IBM and try to get a trial version of both platforms and test it in your business environment. This will say which platform suits the end-users best.